December 7, 2016 December 7, 2016 Dr. R. A. As humans, we have a need for certainty as it produces a sense of security within our psyche. However, no matter how young or old we are, life teaches us that unpredictability and uncertainty are the components of its backbone. There are no guarantees in life and the only thing that we can be certain of is change. As such, knowing that life goes on is key to our development and success. This is important because we often think that we are about to die in our dilemma. But, as time rolls on it proves that life really does go on. I know that when we encounter situations that break us and shatters the core of our being it ‘s hard to process the concept of life going on. It is even more difficult when we defined what was lost as the reason for our existence, as without that person , thing, etc. we grapple with the knowledge of who we really are. I have had many of those core-shattering experiences that forced me to examine who I am and to whom I belong. It is those moments, however, that I believe brings us back to our center – realigning us, as life has a way of getting us off balance. In one of life’s teachable moments, I was told a story of a king who had asked a jeweler to give him a gift that would make him happy if he was sad, and sad if he was happy. This request weighed heavily on the jeweler as without producing this he would loose his life. For days he went sleepless until he prayed and asked God for a revelation as to what he should give the king. With God’s instructions, he made a ring for the king. Upon delivery, the king looked at it with a puzzled look, but when he read the inscription he understood clearly and knew it was the perfect gift. The inscriptions read “This too shall pass.” When I heard the story, it pierced me through like a very sharp two-edged dagger, because of the profundity of its truth. 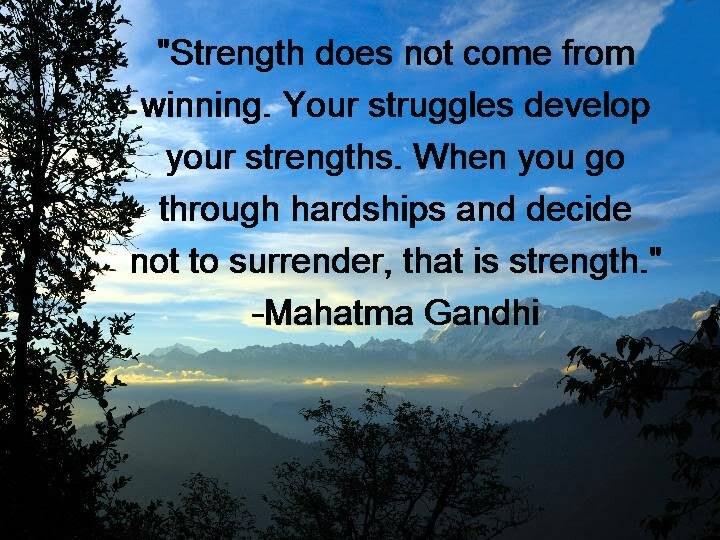 I shared this because it is one of the keys to the developmental process of inner strength. Knowing that there will always be experiences reflecting the terrain of mountains and valleys. Your circumstances will change whether good or bad. I also know that society and life teachs us to be guarded. However, if we are honest, we know that beneath our hard exterior that we sometimes portray is a soft interior filled with various vulnerabilities. Vulnerabilities that if exposed gets damaged easily, resulting in us locking our true selves behind invisible bars of steel. I also know that the only way for healing to take place if for the wound to be exposed to a physician who can administer the necessary drug, ointment, bandage or surgery, etc. Therefore, the final and most important key to developing inner strength is looking to God. We look to Him through prayer. The Apostle Paul stated, “I pray that from his glorious, unlimited resources he will empower you with inner strength through his Spirit.” God is the one who has an unlimited supply of whatever we could possibly have need of. If it is love that we need- the songwriter said: “His love has no limits.” If is is grace that we need it is also said: “His grace has no measure.”If we have need of power, it is also said: “His power has no boundary.” God is capable of empowering us with inner strength and supplying all of our needs. When we expose our vulnerabilities to God, He will administer the right care according to the need. Amen to this. Nobody is a failure in God’s eyes. When everything seems absurd and we’re starting to feel a lot less hopeful and a little more anxious, we only need to say a prayer. God is our ultimate source of help and encouragement. Yes is God is the Source!